“The scale of the city’s devastation is heartbreaking and the psychological trauma that Mosul residents endured is as bad as the damage to the infrastructure,” says Dr. Hamid Ahmed, Advisor to the Prime Minister of Iraq. He attended the International Conference for the “Revive the Spirit of Mosul” initiative at UNESCO Headquarters on 10 September 2018 and spoke to UNESCO about the state of the education system in the country and the long road ahead to recovery. With the destruction of educational facilities, homes and major population displacement, there are multiple priorities and major challenges in education for the Iraqi Government. One of the main tasks is rebuilding the infrastructure as many schools and educational facilities have been heavily damaged and others are not up to the standards that the country aspires for its children and young people. Another huge task is to update and replace outdated teaching equipment, learning materials and curriculums that are currently used throughout Iraq to catch up with the rest of the world. “It is important to remember that Iraq was insolated for over 35 years and hindered from accessing and participating in the advancements of the modern world,” says Dr. Ahmed, who explained that the education system in his country was considered one of the best in the Middle East by UNESCO during the 1970s. However, since 1980, starting with the long conflict with Iran, followed by sanctions and two Gulf wars, the education sector in the country was crippled and took a back seat. 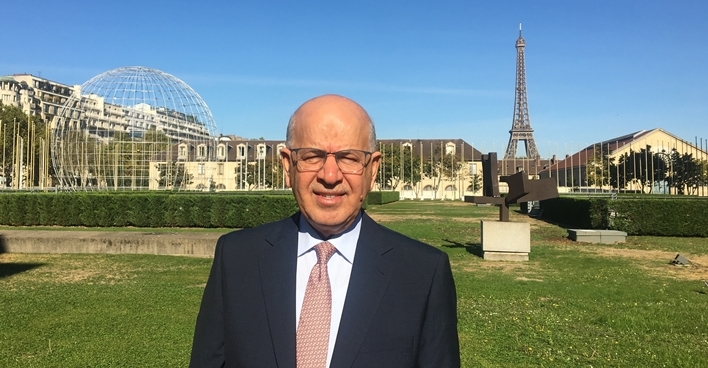 Starting in 2009, Dr. Ahmed was in charge of drafting a national strategy for education and higher education to modernize the sector, with the assistance of UNESCO and other international organizations. A wide range of analysis was conducted over a three-year period to assess all aspects of the education sector including infrastructure, curriculums, quality of education, capacity building and overall governance of the system. The strategy was designed to be implemented for the 2011-2020 period. Unfortunately, ISIS took over a third of the country including three major provinces in June 2014. According to Dr. Ahmed, at least 20 per cent of the government’s budget must be dedicated to the Ministry of Education in order to rebuild, rehabilitate and modernized the entire system. There is a major shortage of schools throughout the country and at least 3,000 new ones have to built in order to accommodate the urgent need. Dr. Ahmed wants to ensure that the new school curriculums in Iraq include all the learning of all the targets of Sustainable Development Goal 4 because they are key to nurturing the peaceful values that all human beings should possess. He also plans to incorporate educational materials and learning tools such as UNESCO’s policy guide on preventing violent extremism through education. Among the countless schools, monuments and homes destroyed in Mosul is the University of Mosul Library, which was set ablaze and gutted during the war. UNESCO is committed to supporting the rehabilitation and modernization of the library through the “Revive the Spirit of Mosul” initiative. “Revive the Spirit of Mosul” is a UNESCO priority for the coming years and is the most important reconstruction campaign undertaken by the Organization in recent times. The initiative is a joint effort to rebuild the heritage and revitalize the educational and cultural institutions of Mosul, in close cooperation with the Government and people of Iraq, especially young people. UNESCO will invest its technical expertise and mobilize funding to support the country rebuild the education sector. Find out more about the #ReviveTheSpiritOfMosul initiative and follow the conversation.